In my first theatrical experience of the new year, I saw Tony award winning Broadway actor Brian Stokes Mitchell at Orchestra Hall last weekend. I know him best as the voice of Coalhouse Walker, Jr. in the original cast of Ragtime. I've never seen him in the role but it's one of my favorite soundtracks (which I've been listening to a lot lately in anticipation of Park Square Theatre's upcoming production featuring an all-star cast of local talent). It was one of those rare experiences when one of your favorite soundtracks comes to life, when a voice and a song that's so familiar is live right there in front of you (like when I saw Anthony Rapp and Adam Pascal in RENT a few years ago). Brian performed with the fabulous Minnesota Orchestra, led by Sarah Hicks and her super-toned arms (I want that workout!). To begin the show, the orchestra performed a medley from the Rodgers and Hammerstein musical Carousel, and then Brian appeared to sing "Some Enchanted Evening" from South Pacific. His voice in person is everything it is on recordings: deep, rich, expressive, gorgeous. Not only that, but he's also handsome, charming, funny, and entertaining; an engaging performer. As expected, he sang a selection of musical theater classics, some from musicals that he's appeared in ("The Impossible Dream" from Man of La Mancha, his encore) and some that he hasn't ("Soliloquy" from Carousel, "Don't Rain on My Parade" from Funny Girl). But he also sang some standards from outside the musical theater world ("How Long has This Been Going On," "Waters of March," a Gershwin medley). In an interesting twist, he blended the Duke Ellington classic "Take the A Train" with "Another Hundred People (Just Got Off of the Train)" from Sondheim's Company. Brian was involved in writing the children's alphabet book Lights on Broadway, and he sang the single that goes along with the book. 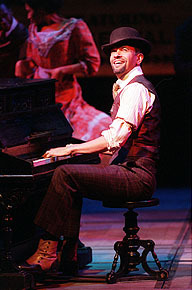 "I Was Here" was written by Lynn Ahrens and Stephen Flaherty (the composers of Ragtime) and tells about the life of an actor. One of my favorite moments was when Brian put down his mic to sing another song from South Pacific, "This Nearly Was Mine." With the orchestra playing softly behind him, his voice soared through the beautiful acoustics of Orchestra Hall. It was magical. But of course, what I was waiting for was the glorious "Wheels of a Dream" from Ragtime, and I was not disappointed. He sang it in a medley with "America the Beautiful," and it was a lovely expression of hope for a better world and a belief that those dreams will come true. I've had the good fortune to see several of my favorite Broadway actors perform at Orchestra Hall, both with and without orchestra accompaniment. Bernadette Peters, Patti LuPone, Idina Menzel, and now Brian Stokes Mitchell. On the top of my wishlist is Mandy Patinkin, so I'm putting that out in the universe: Mandy Patinkin, come and perform at Orchestra Hall!